To help promote the forthcoming auction of all the TFL Year of The Bus sculptures for charity, I've created a couple of enhanced 'slide shows' (with a bit of new footage) for each of my vehicles. Croydon Layers from Matt Bannister on Vimeo. Surrey Street Market from Matt Bannister on Vimeo. For more details of the auction, visit the i-Bidder online site. The proceeds from all the sales of the buses (all sixty of them, not just mine) will go to Kids Company, Transaid and London Transport Museum. 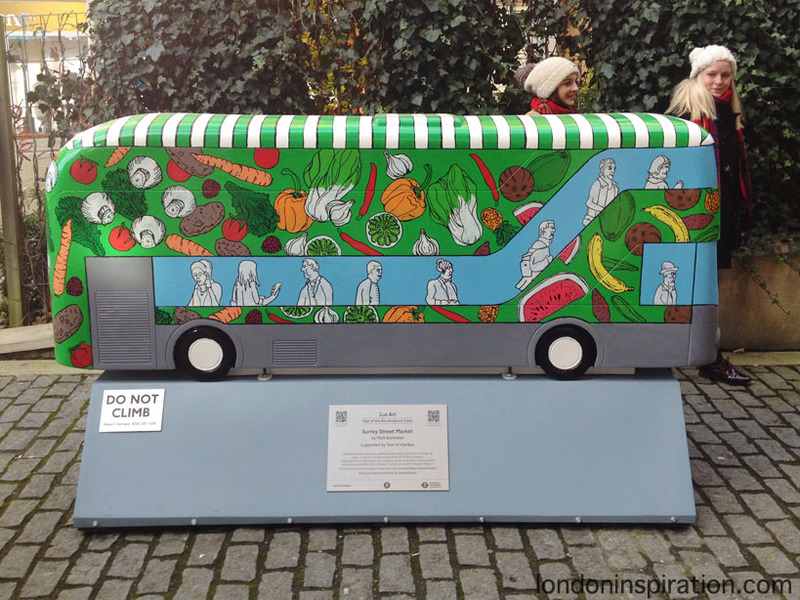 The Croydon Bus sculptures have moved! 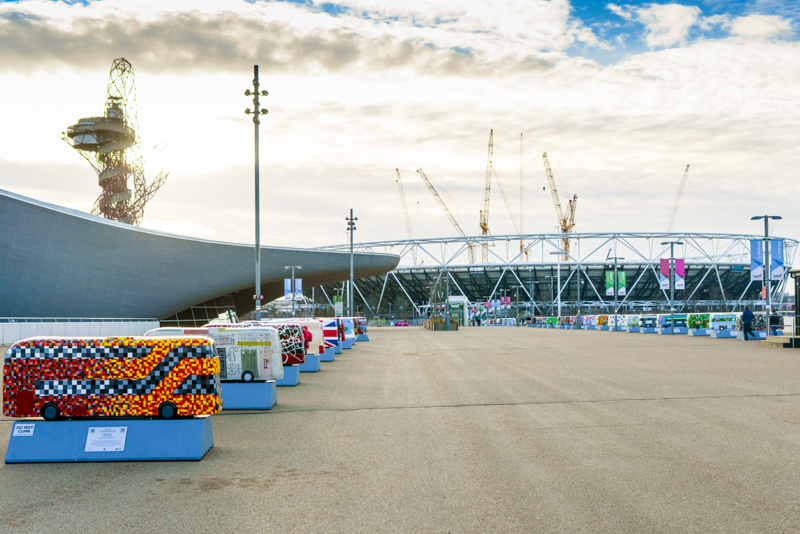 They have joined the other buses at the Queen Elizabeth Olympic Park, Stratford, East London. As required, I took a couple of friends with me to see how my buses were settling in with their new friends and views. Luckily, it was a perfect crisp and sunny day, so there were plenty of other bus-spotters at the park. To see all the other buses lined up across the (very long and wide) bridge near the Orbit was great. 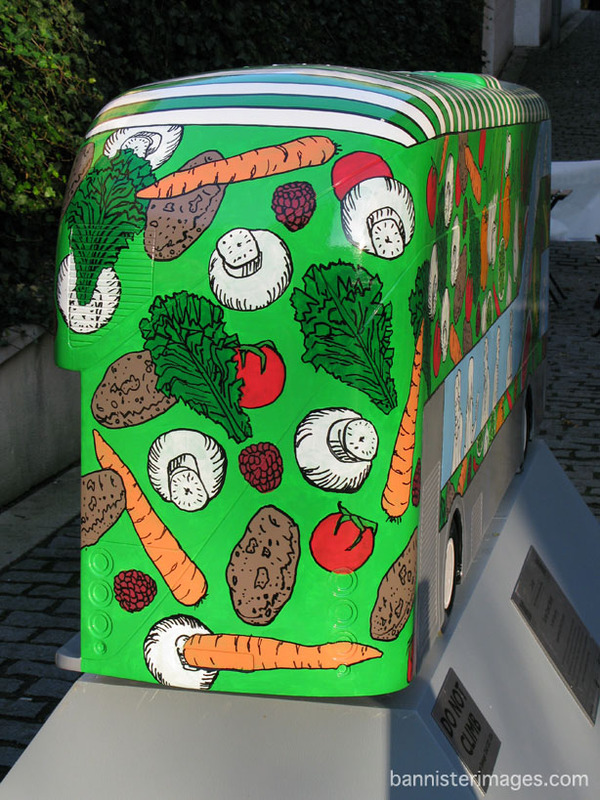 I was particularly impressed to overhear one of the volunteer guides (made famous by the 2012 Olympics/Paralympics) explaining the different types of fruit and veg on my Surrey Street Market design. They had obviously done their homework and read the blurb I wrote for the TFL website. Kids Company, who provide practical, emotional and educational support to inner city children, young people and vulnerable families. Transaid, an international development charity who identify, champion, implement and share local transport solutions to improve access to basic services and economic opportunity for people in Africa and in developing countries. London Transport Museum, a popular Covent Garden museum highlighting the vital role transport has played in the life of the Capital. 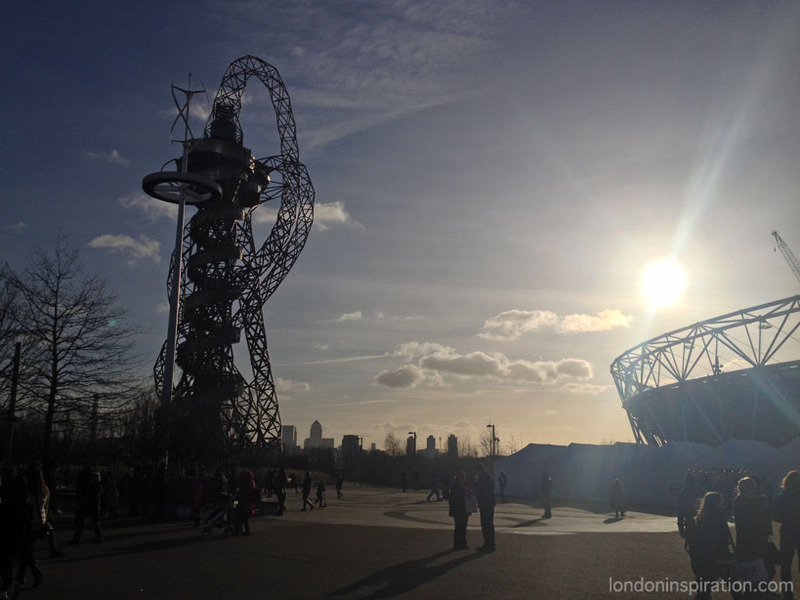 They also work with more than 150,000 children each year delivering essential travel safety education to keep our children safe, and they run programmes to help young people into employment. I made a pilgrimage to see my buses (again! ), and to take some better photos. Whilst out in the winter sunshine, trying to eavesdrop on what other people where saying about my work, I realised that after 25th January - my buses will disappear! There is always a chance that someone (or an institution / company) might buy one in the charity auction in February, but as far as I'm concerned I'll never see my work again. Please stand clear of the closing doors. For a little glimpse into the past workings of my October brain, I've included here the original designs I submitted to Wild in Art. 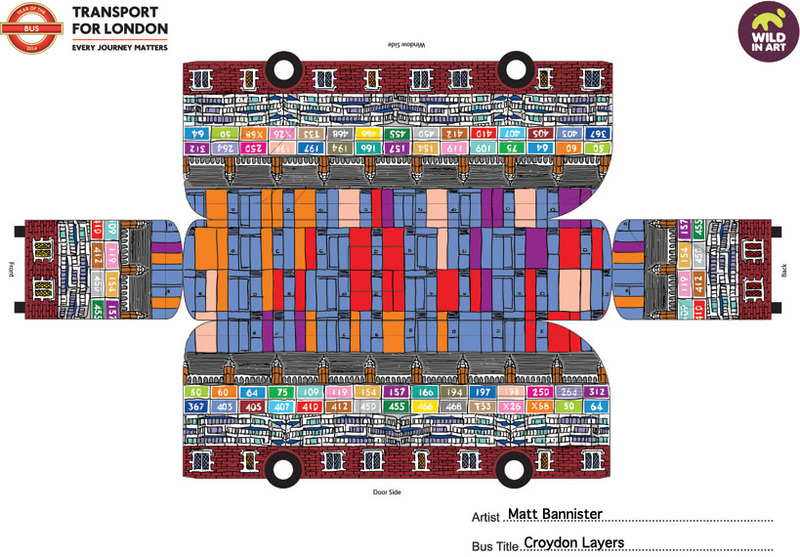 The 'Croydon Layers' design is very similar to the final bus, but the 'Surrey Street Market' one is more complicated than what eventually happened. A fast approaching deadline was the main influencing factor in making these changes, but I'm still very happy with what I eventually produced. 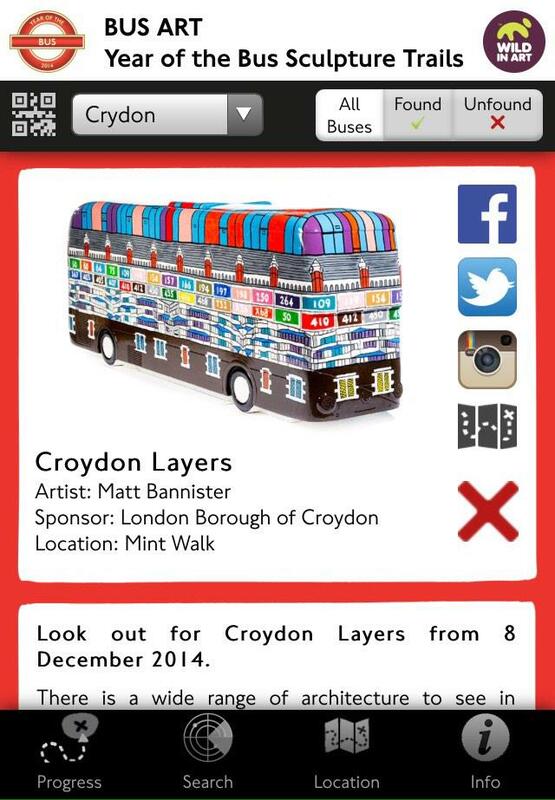 On a sunny December day, my buses joined the trail in Croydon after a little press launch. 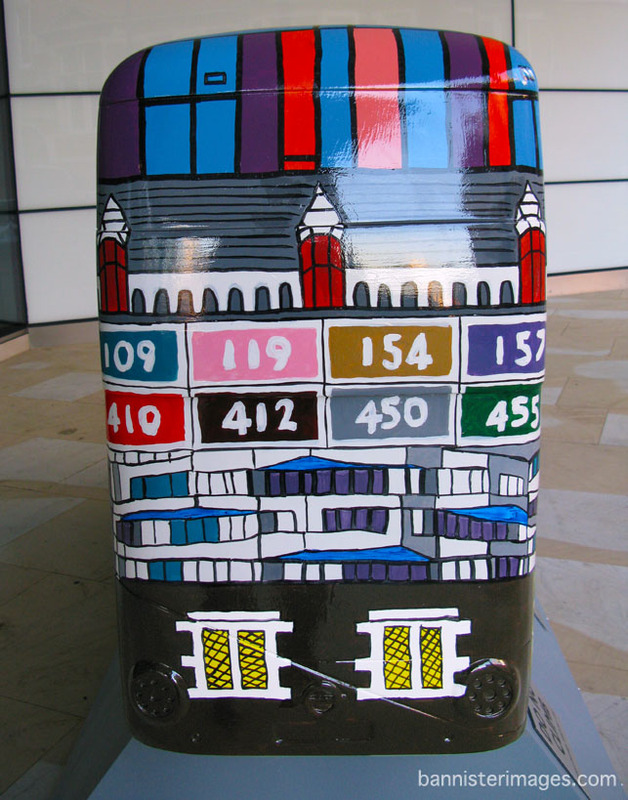 The 'Croydon Layers' and 'Surrey Street Market' sculptures hit the streets! The first bus of mine, that we came to on our mini tour of Croydon, was 'Surrey Street Market'. It's nestling in Matthew's Yard (rather appropriately), directly outside the cafe/arts venue of the same name. It's also a potato's throw from the market itself. The next stop was my bus 'Croydon Layers', which can be found directly outside the doors to the Council offices, in Mint Walk. Transport for London have also produced some slick photographs of the buses, taken under studio conditions. They look great, and really make the colours pop out.